Super 14 and Fun in the Sun!! What were they thinking, and here I am talking about that 15 Stormers that were on the field yesterday. What a bunch of wallies … I have not seen a bunch of guys that for 80 minutes had no idea what they were doing. On yesterday’s performance they do not deserve to be in the semi’s. Well done to the Sharks that showed how it should be done. Good luck to them and let us all go out and support them next weekend against the Waratahs. Over the past week, I have spend 3 glorious days in Sun City courtesy of IBM for great work delivered during 2007. I was one of the lucky one’s that stayed in the Cascades hotel and what a joy. I was not like Tertia and spend basically all my allowance provided by IBM. Went on a game drive early on the first morning and almost froze to death but what a great drive. Got to know a elephant … the driver had to quickly start the vehicle and move away so close the elephant got. Also was treated to a baby white rino, “rooikat”, zebra, giraffe, impala and various other wildlife. Unfortunately we did not get to see lions or cheetahs. Went on a walk through the Sun City forest over hang bridges and through waterfalls. The photo above is from behind the waterfall. Bet you did not know you can walk behind waterfalls in Sun City. For those that know me, no I did not play golf. We could not play the Gary Player course since there was a Pro Tournament on at the time and I do not like the Lost City course so decided to give golf a skip. Above is picture of the 9th hole on the Gary Player course and below the Lost City course taken from the tower on top of the Palace of the Lost City hotel. 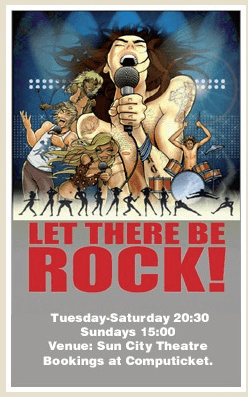 On the first evening we went to watch the show, Let There be Rock, and I thoroughly enjoyed it. One pity is that they played no Queen music which was a bit weird since I cannot see how you can have a Rock music show without Queen. Lounged around the pool, sipping cocktails and beers. Spending time with friends. Just had a great 3 days away from the office and did not had to worry about work and all the other things that is going on in my life. Thanks IBM, I really enjoyed it and appreciate the gesture. A friend of mine will be spending the next week there on a conference. M, if you read this, take some time out from the hectic conference life and just enjoy some of what Sun City has to offer. You can see all the Sun City photos on my Flickr stream. This amazing sunrise was taken one morning about 2 weeks ago. It looks like the whole sky was burning and had all these shades of orange and red. Pity about the Stormers that only managed a draw last night but taking the weather into account I think we should take what we got and move onto the next game against the Lions. 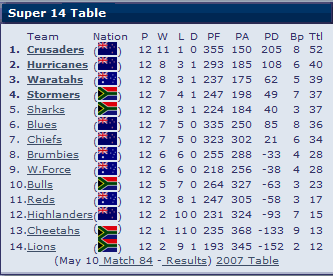 The Stormers is 4th on the log and still in the running for the semi’s. They would probably battle to get a home semi. 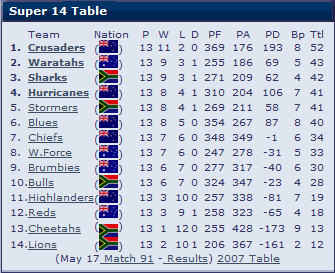 It would be good if the Sharks can also move up to the semi’s. So back to the title of this post. About a month ago I started working on a big new assignment with a company based in Johannesburg. I am still with IBM and are working on the outsourcing deal between MTN and IBM. This basically mean that I stay in Cape Town and work in Johannesburg. I travel up beginning of week and then back to Cape Town towards the end of week. I use to stay in hotels but that just got to me. Now I use a guesthouse and go back to the same one each time and try to stay in the same room. Now at least it feels like home away from home. The travelling in airports and airplanes is really tiring. We have estimated that a round trip can take anything up to 10 hours if you take into account time from home to airport, picking up car and then trip from airport to destination. On my next trip which starts 20 May I will stay longer which mean a weekend in Gauteng. This will be a new experience since I have not really spend leisure time in Gauteng yet, so will need to find things to do. Anyone in the area that knows me and want to meet for coffee or drinks, just let me know and we can make a plan. Last week Thursday evening we had the Welcome event for all new IBMers that joined us from MTN. Welcome to all the new IBMers, trust that you will enjoy your stay and work with us here at IBM. Now some of my colleagues really let their hair down. Next week I am off to Sun City with over 200 of my colleagues for a well deserved break and to have some fun in the sun. Thanks to IBM GTS which had a great year last year.